President Trump’s nuclear strategy not only increases the likelihood of nuclear conflict but also incurs a tremendous financial cost. Additionally, the cost of maintaining and modernizing U.S. nuclear forces is projected to cost at least $1.2 trillion over 30 years, drastically increasing U.S. defense spending. The U.S.’s overwhelming military capabilities and the presence of U.S. troops on the Korean Peninsula are primary motivators for North Korea’s nuclear program. Over a 20-year period, a 1% increase in military spending will decrease economic growth by 9%. 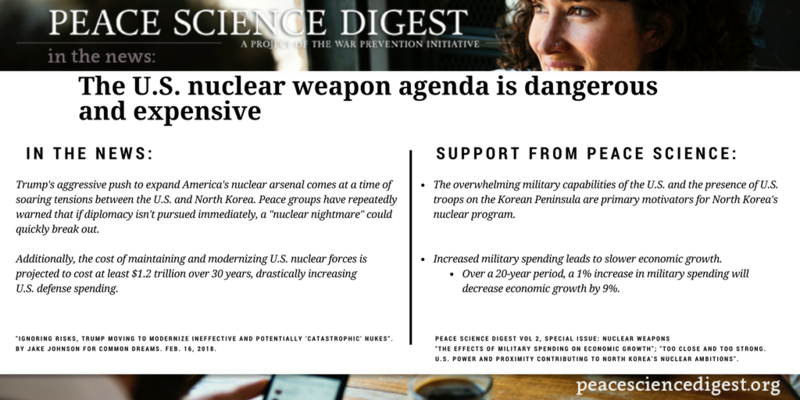 Peace Science Digest Vol 2, Special Issue-Nuclear Weapons: “The Effects Of Military Spending On Economic Growth“; “Too Close And Too Strong. U.S. Power And Proximity Contributing To North Korea’s Nuclear Ambitions“. Ignoring Risks, Trump Moving to Modernize Ineffective and Potentially ‘Catastrophic’ Nukes by Jake Johnson for Common Dreams. Feb. 16, 2018.